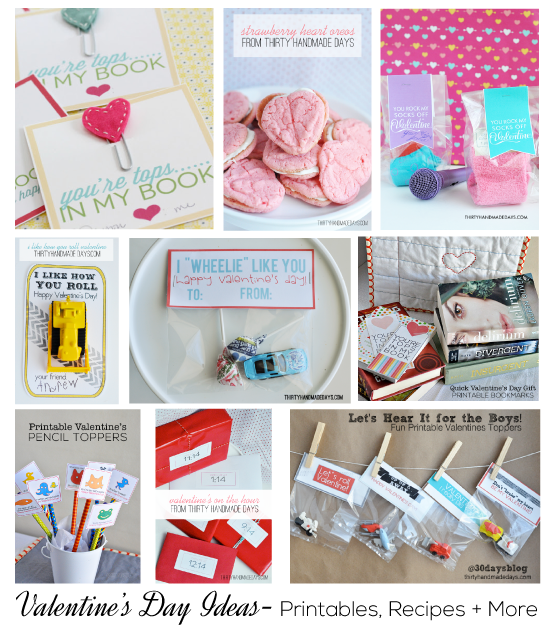 A cute Valentine’s Day idea that anyone would be excited to share with their classmates! For Christmas Julia got a loom kit. Along with the rest of the world. She’s been busy whipping up creations ever since. Last week it occurred to me that since she had so many bracelets done (over 20), we could make a Valentine’s Day treat for her class with them. There is a “no food” policy at my kids school and it can be hard to come up with ideas that are cute, inexpensive and easy. Loom bracelets are the perfect thing for her sixth grade classmates. I created a printable tag to go with the bracelets and had her approve all along the way – “Do you like the colors?” “What about the fonts?” “Do you like it better this way or that way?” I’m happy to say that she gave the thumbs up on the final product. The best part is that she did the hard part! Now we just have to put them together. 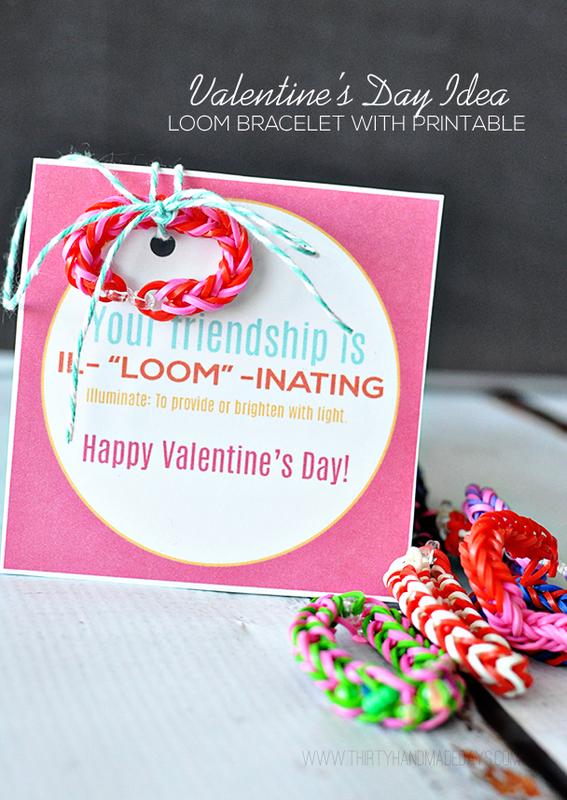 Loom bracelets – you can find kits, supplies and tutorials all.over.the.place. Julia used You Tube videos to create hers. These fit perfectly in self sealing 5.25″ x 7.25″ bags. I love those bags! They make everything so easy. So that’s the route we will probably go for Julia’s class. But I think the washi tape and baker’s twine versions are so cute too! You know by now that I just can’t help myself from a good pun. I knew that I wanted to do something with “loom” but wasn’t sure I could make it work. This might be a stretch (get it!? ha) but I think it works. And if kids didn’t know what illuminate meant before, they will now. A treat and learn something new along the way. Bonus! Download an illuminating card page. For personal use only. Thanks! Looking for other Valentine’s Day ideas? I have tons because it’s one of my favorites! Here are a few more…..
Love these! 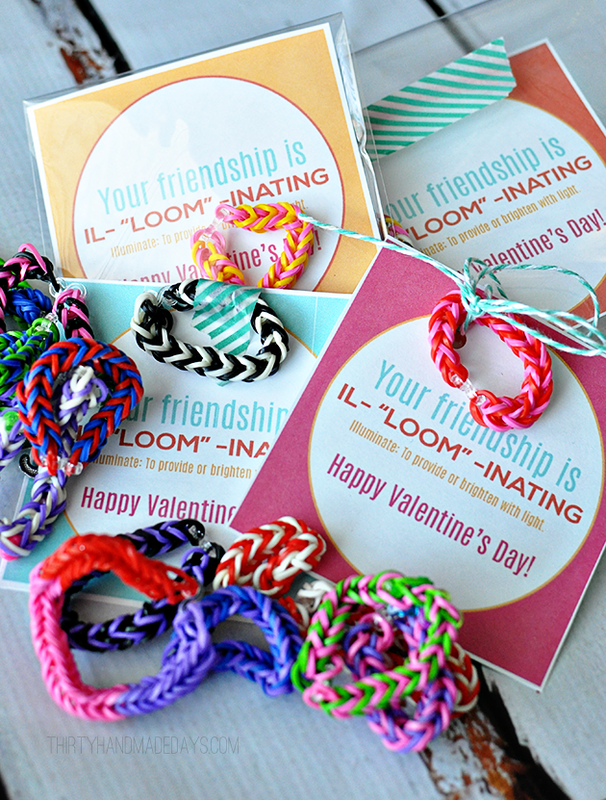 I’m doing a post on Loom Band Valentine’s and will be linking back to you. Thanks for the great idea and printable. I got it to work. I opened it in Photoshop Elements and then printed it and the colors turned out fine. Thanks so much for the idea! My daughter loves these and wants to make these to give out to her class, but I’m having trouble printing. The blue turns out as gray. Would you be able to e-mail me the printable? Maybe that would fix the problem. Thank you! Thanks so much for sharing! My daughter will be doing this for her 1st grade class. I do have a questions though. I ordered the self sealing bags through the link you provided…however the printout is waaaaay small of the size of the bag. The bag is huge! Am I not printing it large enough? Was the wrong size bag posted? Any advice would be greatly appreciated. Thanks! The printed square measures just under 4 x 4 for me. I love these! However, I’m also having a problem printing…after much trouble shooting, it appears maybe a problem with the document, rather than on my end(?) Let me know if you’re able to trouble shoot on your end. You need to have a program that opens PDF’s like Adobe Reader in order to download. I’m trying to print the loom printable and it’s not allowing me? I love the bracelets idea. I teach school and think my students would love to make their own bracelet. Love this! Both of my girls have been on the loom bandwagon (ha!) so this is a perfect idea for them! Thanks for sharing ! What a fabulous idea, Mique! My seven-year-old twins (boys) got looms for their birthday in October, and we have been making them like crazy ever since. They even take them to school to give and trade. The perfect non-food Valentine! We’ll get going on it. And thanks for the creative printable to go with the bracelet! Enjoy your day! I love it! I’m paper obsessed and I love things packages up in pretty clear self sealing bags too- guess I’m obsessed there as well! Anyway love love love!! I follow you on Facebook but I am visiting your link today from the party at Sweet Bella Roos! I love handmade jewelry and these bracelets don’t disappoint- thanks for all your ideas! What can I make for boys like this, that they’d actually wear? 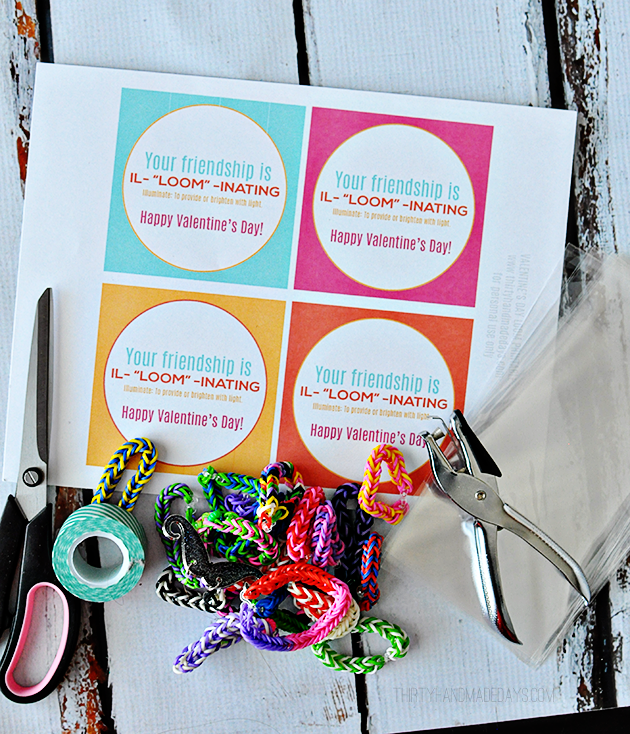 This is such a fun Valentine idea, thank you for sharing the printable cards! Love this! I think both my son and daughter would love to give these as Valentine’s. Being that I am the one making them all the time, I might need to hire some looming help as that would be 48 bracelets, but so worth the cuteness! Thank you so much for your free printable!! My daughter is also making bracelets for her class and your free printable saved me tons of time!! 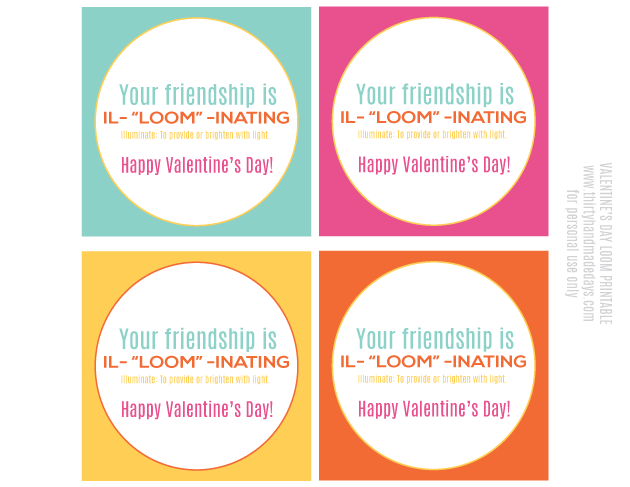 Lots of Valentine love to you!! Too cute!! Thanks for sharing! – My dd got a loom maker for Christmas too! I love the budget book idea. I would like to see your charts computer friendly.